Easy to deploy, highly customizable workflows that are always being upgraded. We help local government agencies and organizations better manage their day-to-day business functions while streamlining and automating outdated processes. Our products extend automation to the field with the MyStaff App engaging your employees and allowing them to perform their jobs more efficiently. Couple that with our convenient citizen-facing web and mobile apps, and we can be your all-in-one solutions provider. Streamline request assignments to departments and staff members with automated routing and notifications, maximizing your efficiency. Staff is updated immediately when an issue is reported. They will receive a push notification if using the MyStaff app, as well as have an email sent to them. Everything in the CRM is completely configurable. From the color scheme and icons to the issues, the sub-types and the auto-response text shared with the citizen when an issue is submitted. Embed a responsively designed iframe into your city website that enables residents to submit requests seamlessly from your city website. Engages citizens to report issues and receive updates, all from their mobile devices. Learn more about our “Best of Breed” mobile app. Staff can receive, assign, manage and resolve issues from their mobile device. 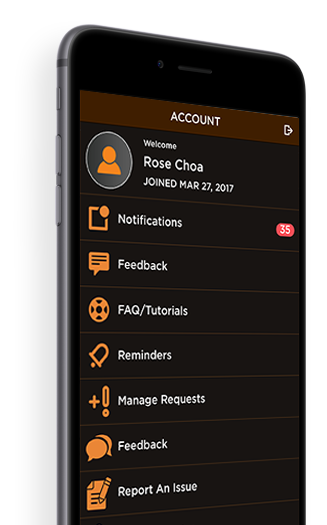 Other features include chat, reminders, issue reporting and more. View a real-time snapshot of your city’s most important metrics. Exportable reports, heat maps and custom reporting ensure your team has the most accurate information possible. We play well with others. We integrate with all the major CRM providers and in some instances, integrate with multiple in one app. Your citizens should have a seamless experience regardless of where the issue is being routed. 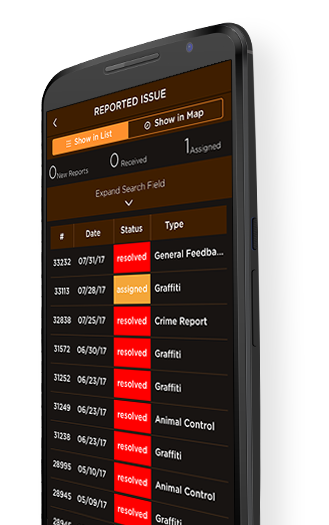 Staff and citizens can communicate with each other through the MyReports section of the app. Ensuring staff has accurate information and the citizens are engaged, receiving the highest level of customer service possible. Leverage the city’s GIS layers to ensure issues reported are inside city boundaries or manage routing and workflow based on issue location. Turnkey SaaS platform makes configuring and launching your CRM a breeze. We can have you up and running in less than 30 days. Put Public Works in the palm of your citizen’s hands and connect on a more meaningful level. Users will be engaged from the point they submit an issue until it is resolved with status updated and two-way communication functionality.